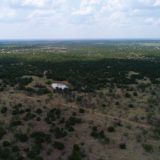 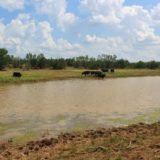 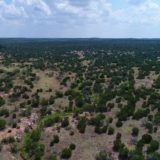 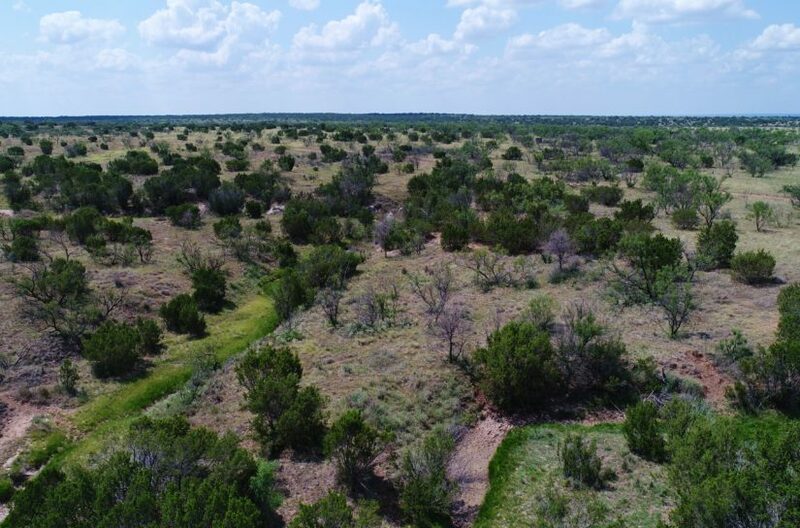 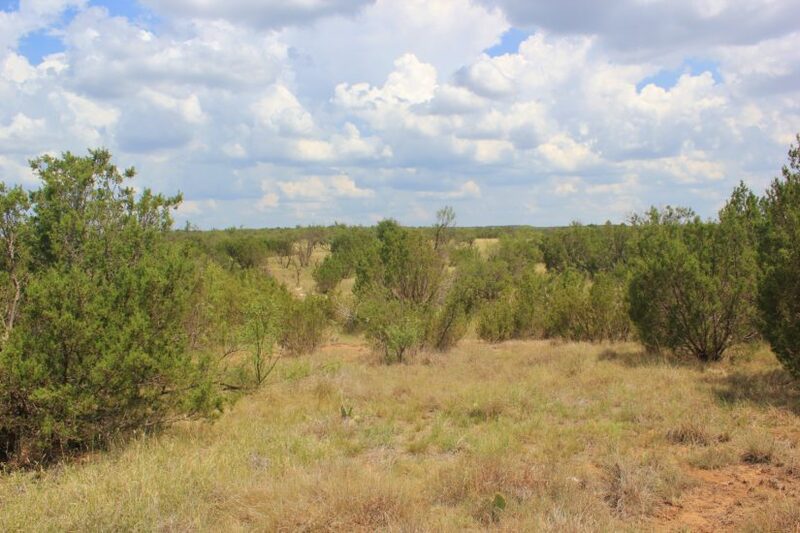 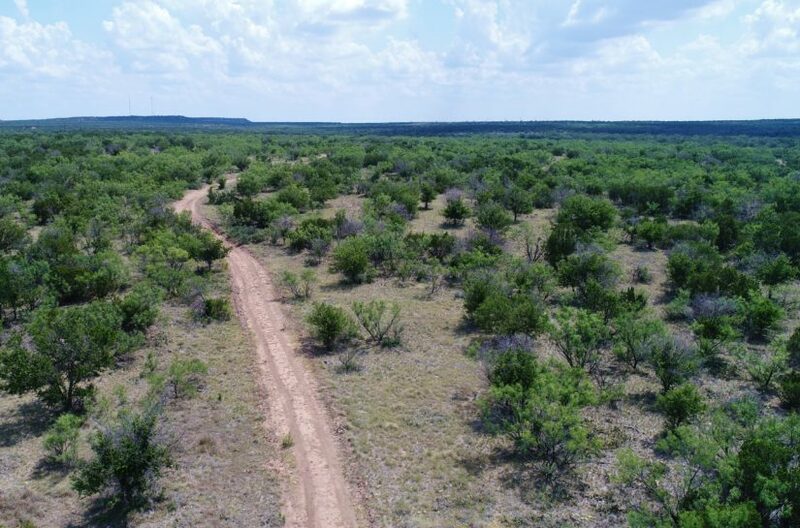 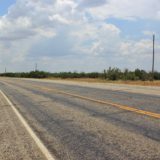 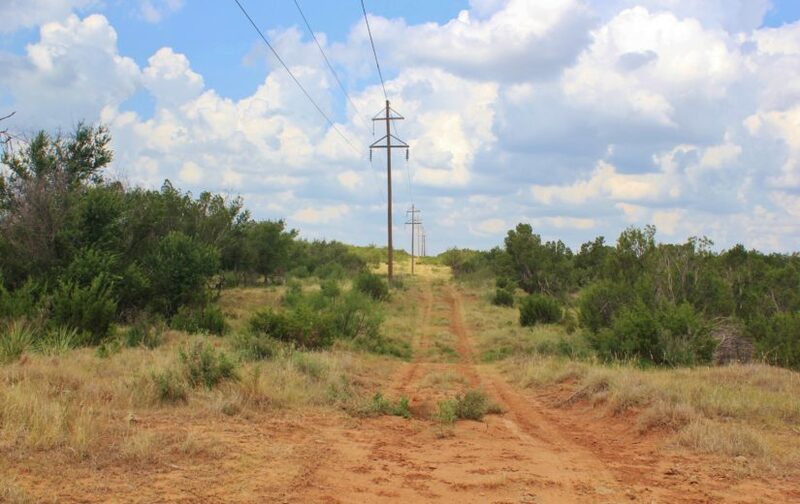 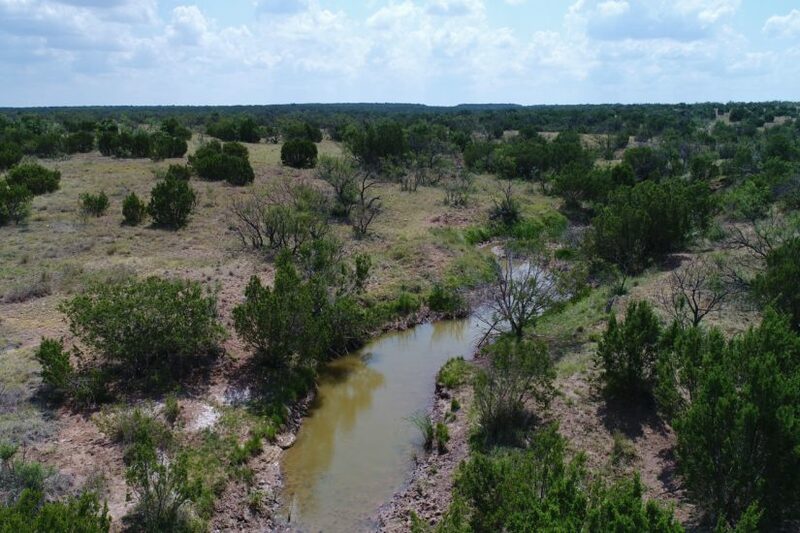 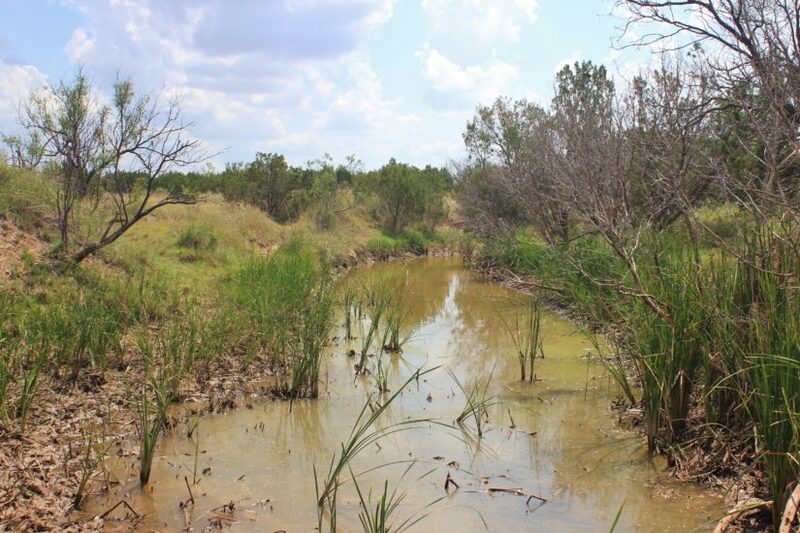 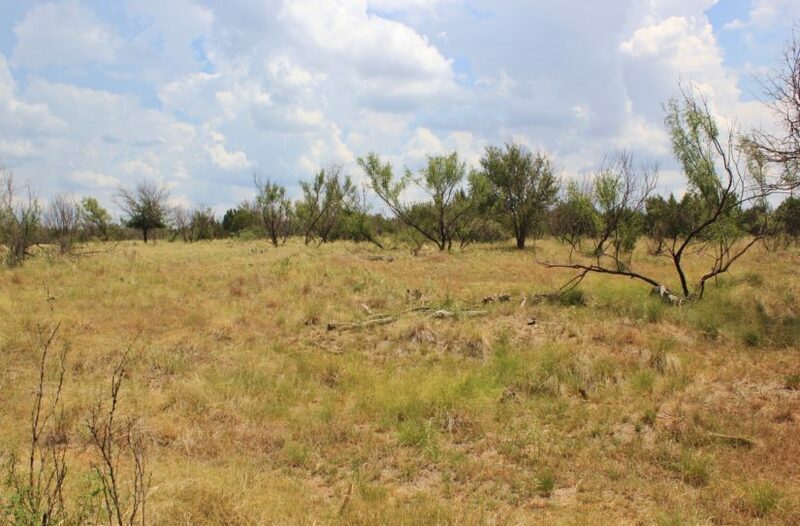 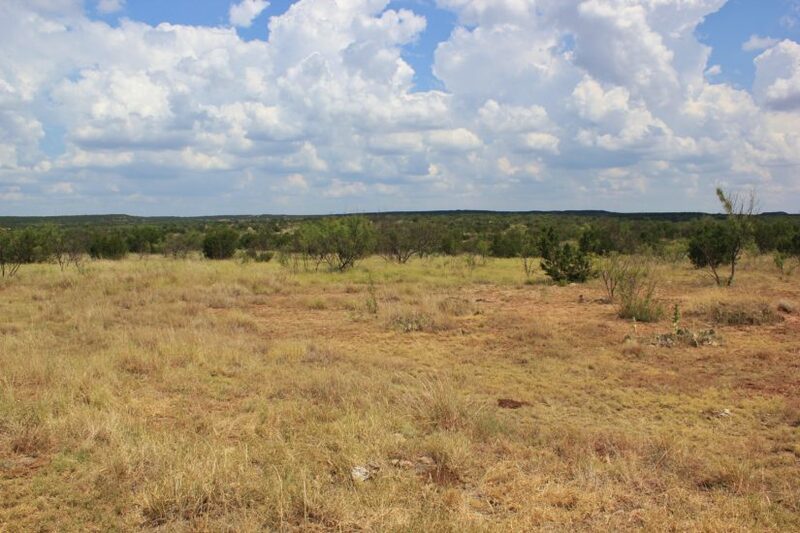 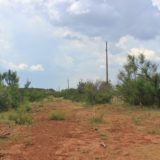 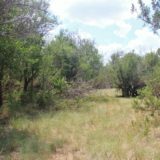 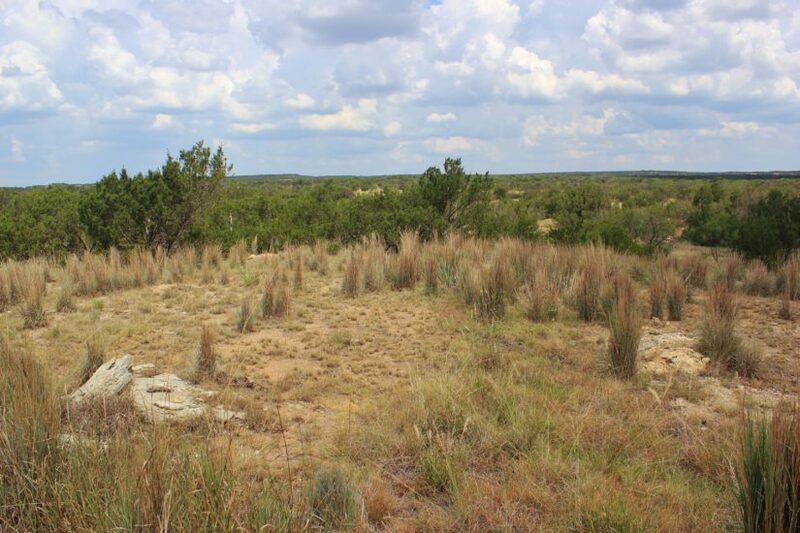 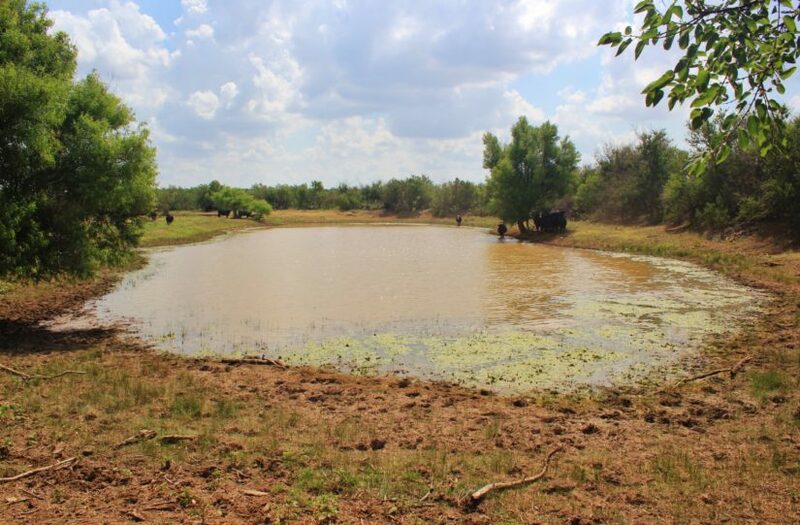 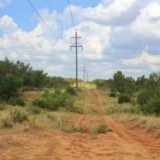 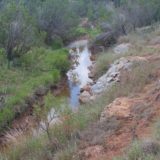 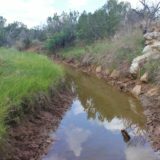 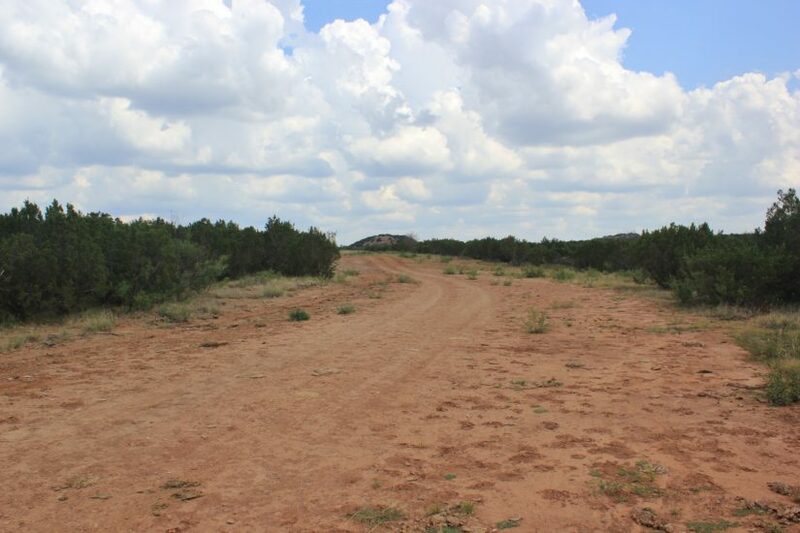 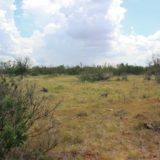 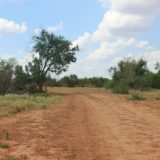 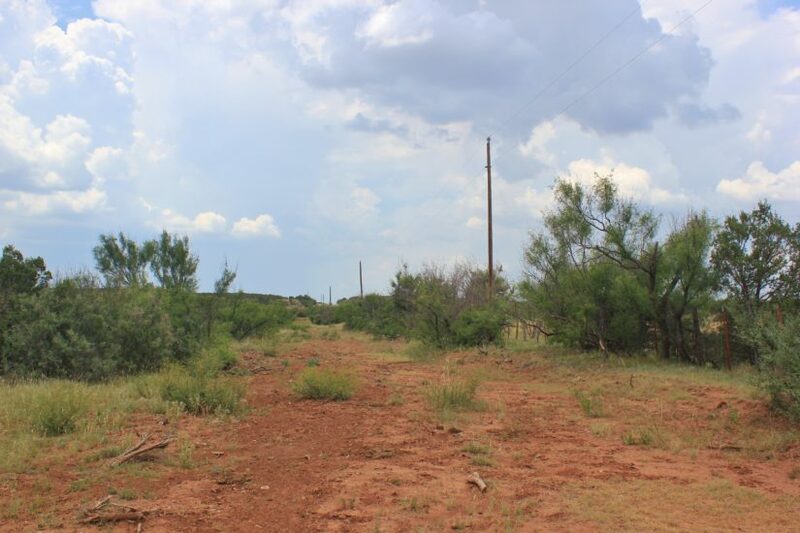 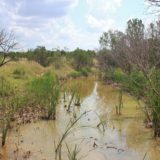 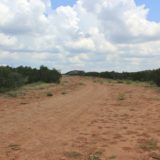 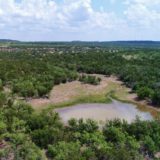 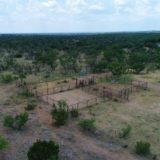 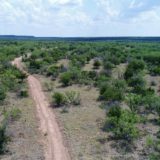 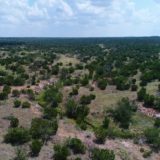 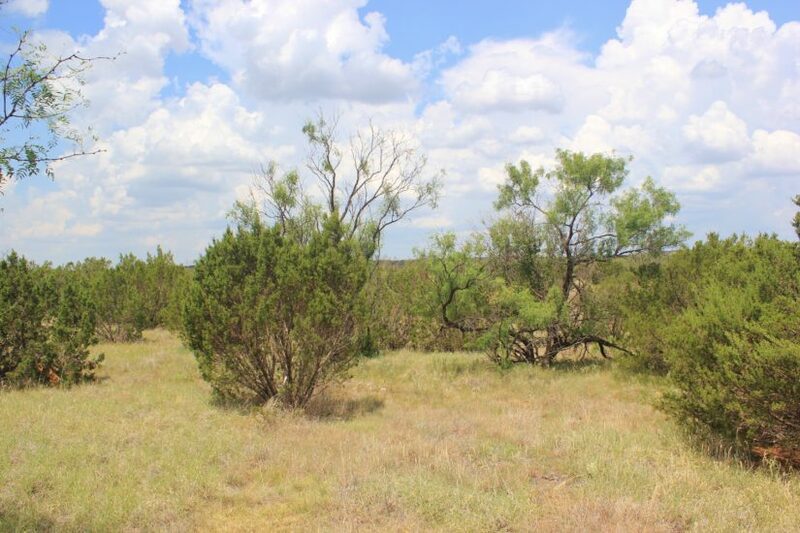 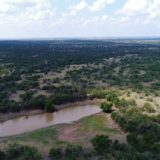 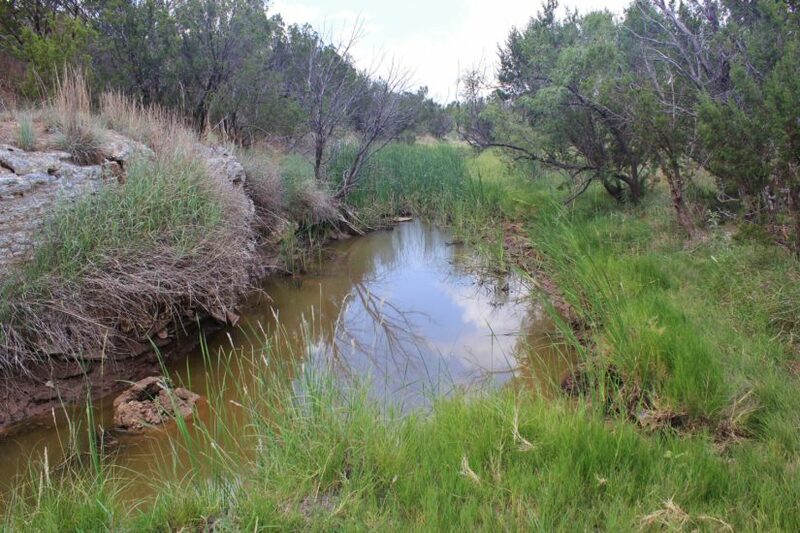 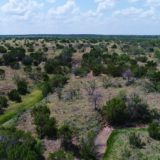 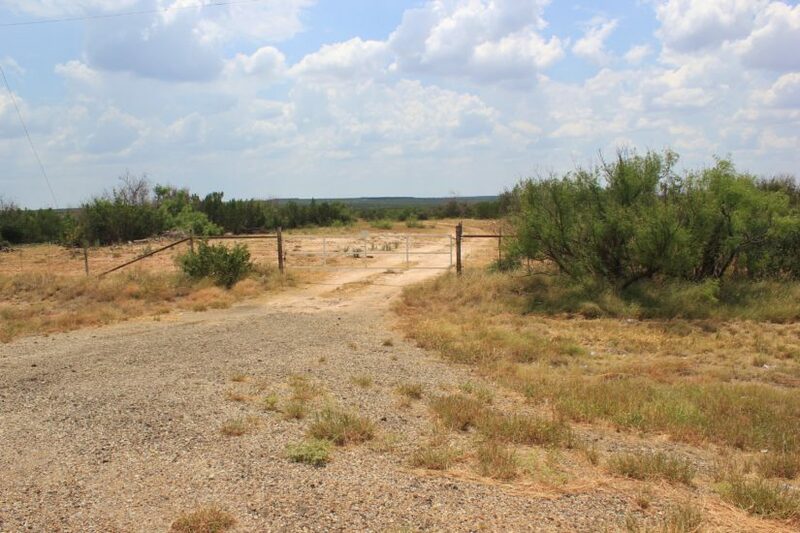 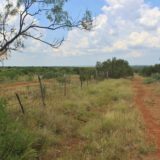 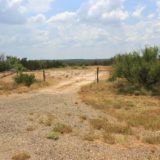 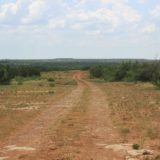 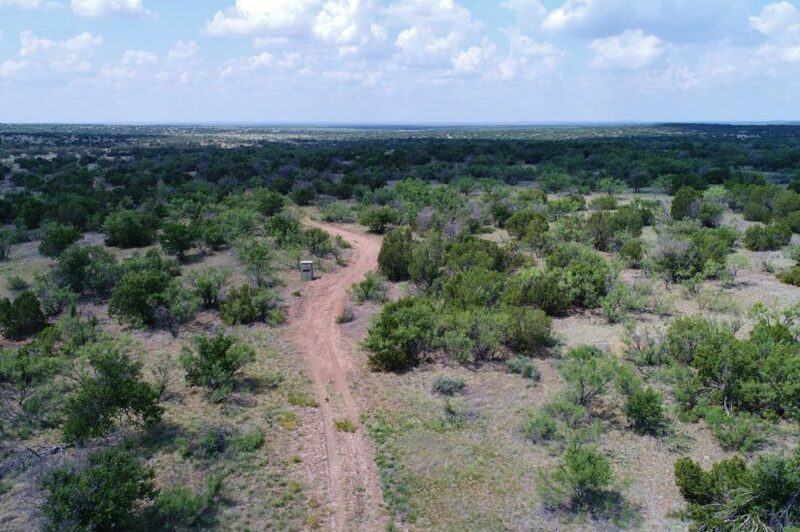 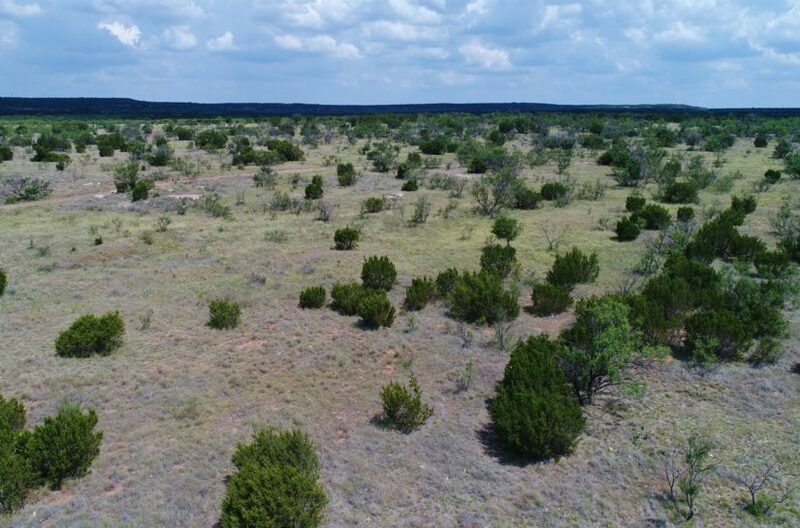 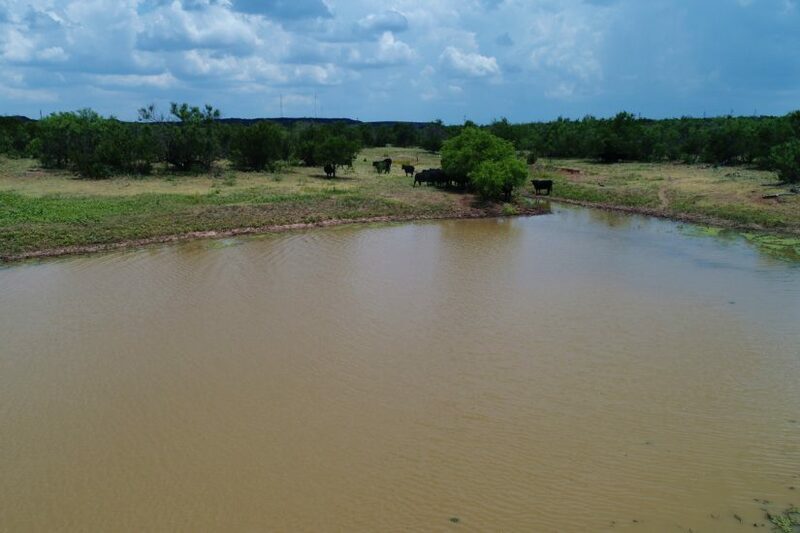 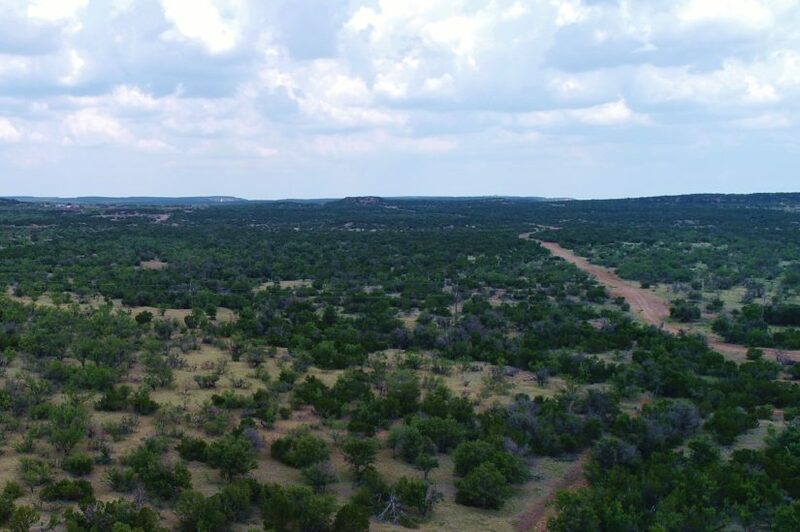 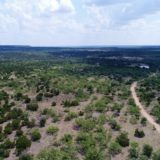 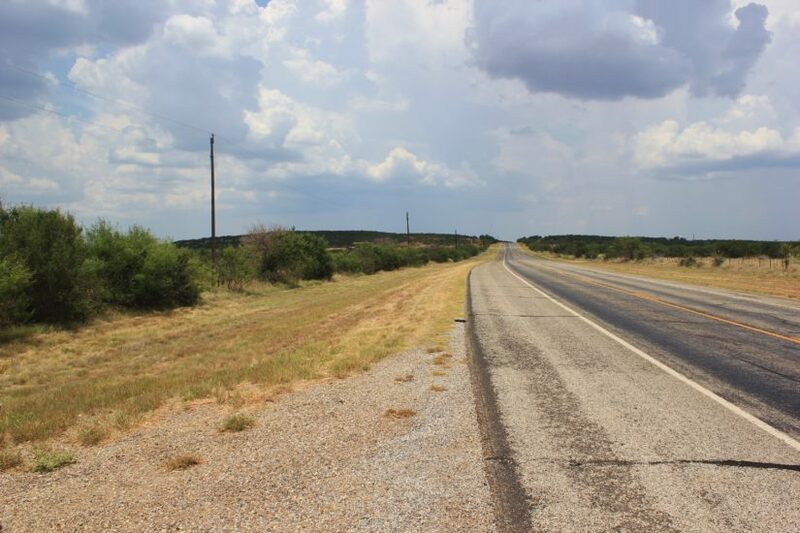 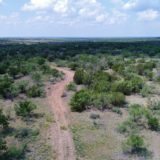 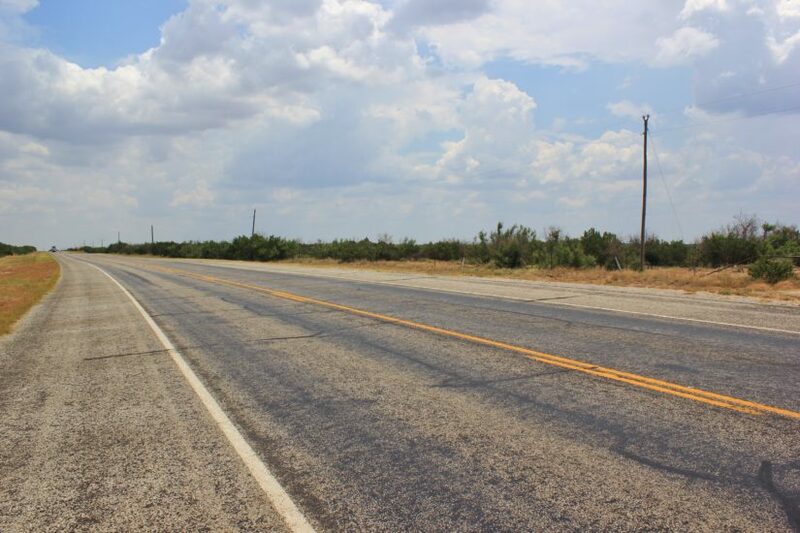 This 961.5 +/- acre ranch is located west of Crowell on Highway 70, in Foard County, Texas. 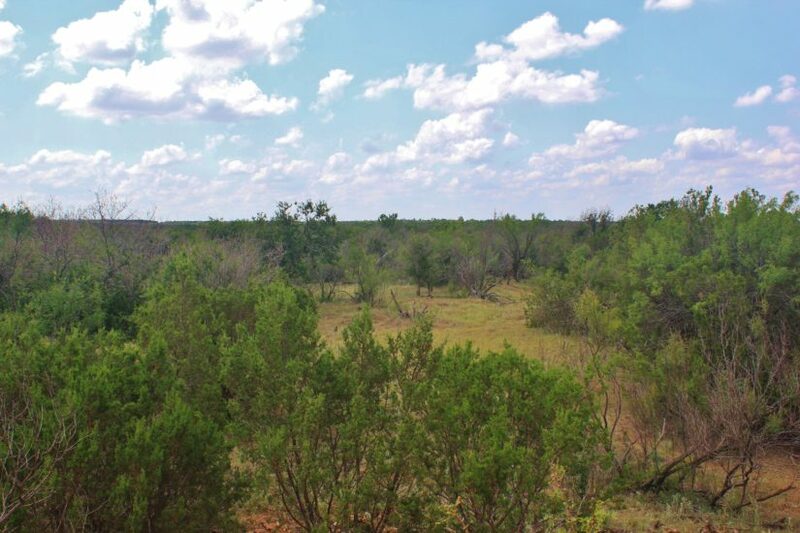 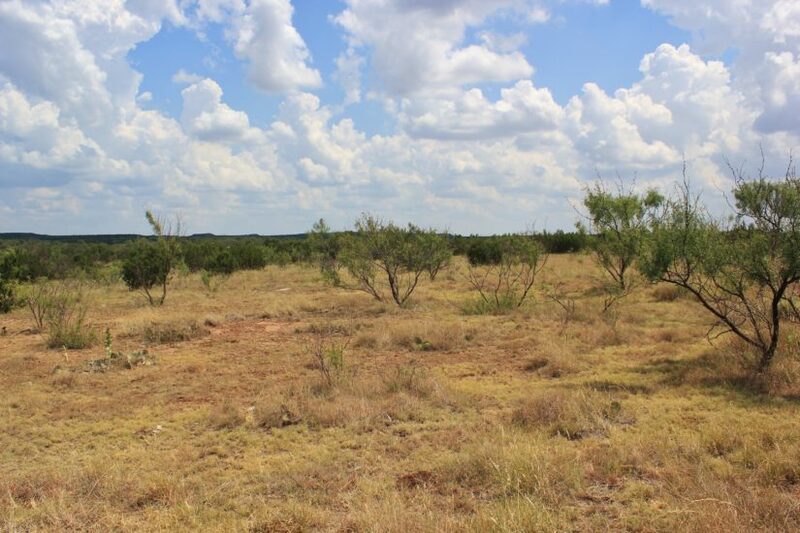 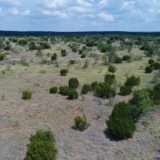 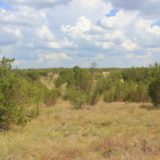 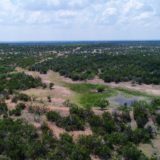 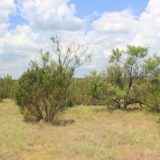 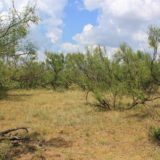 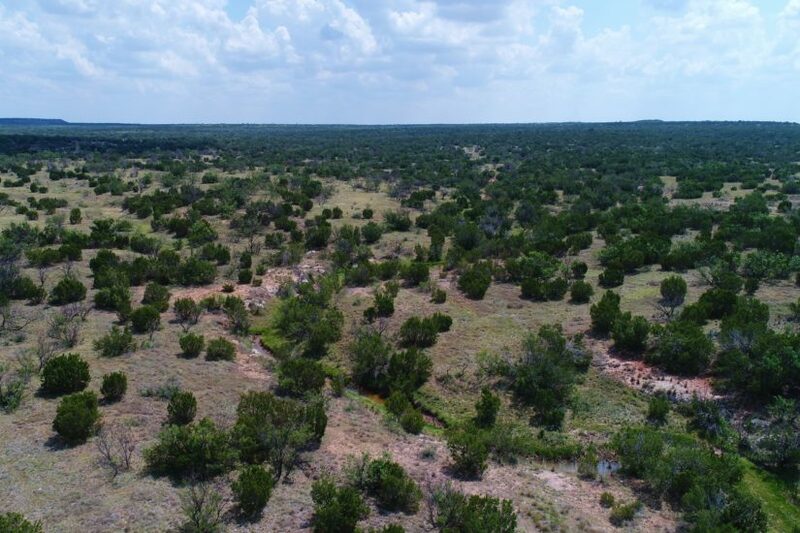 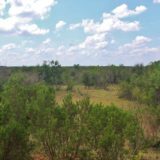 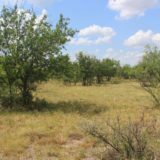 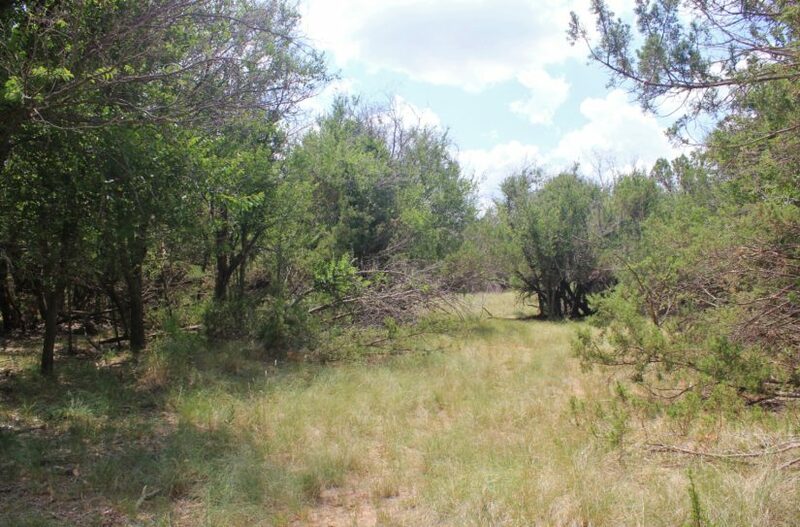 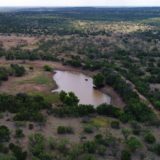 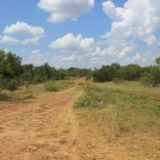 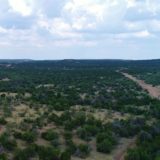 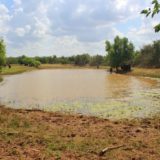 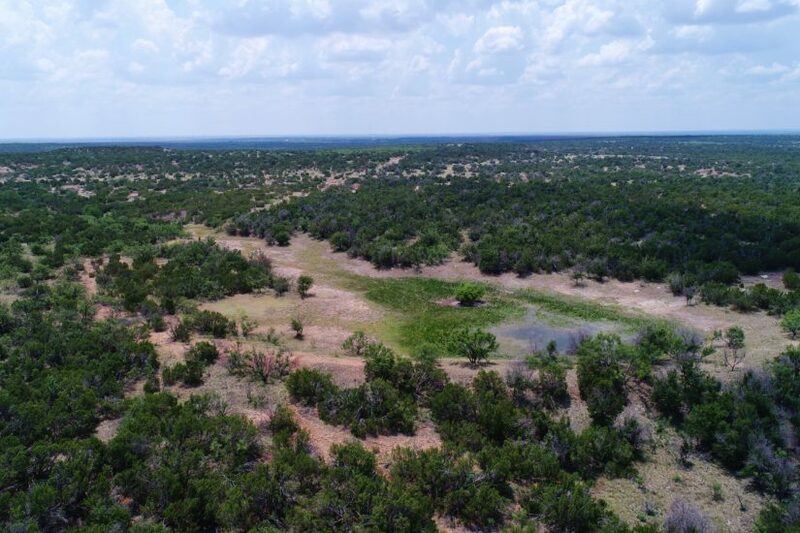 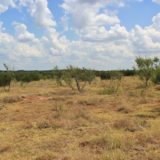 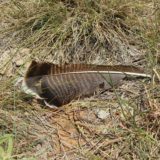 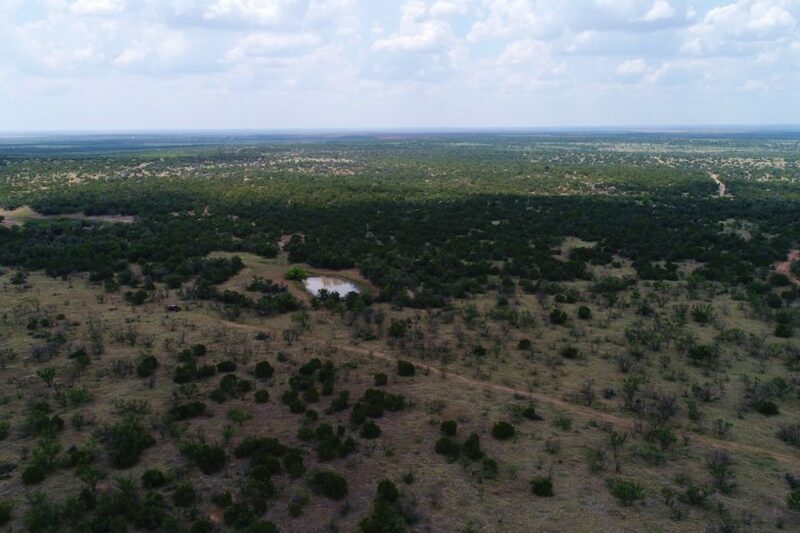 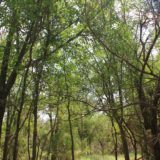 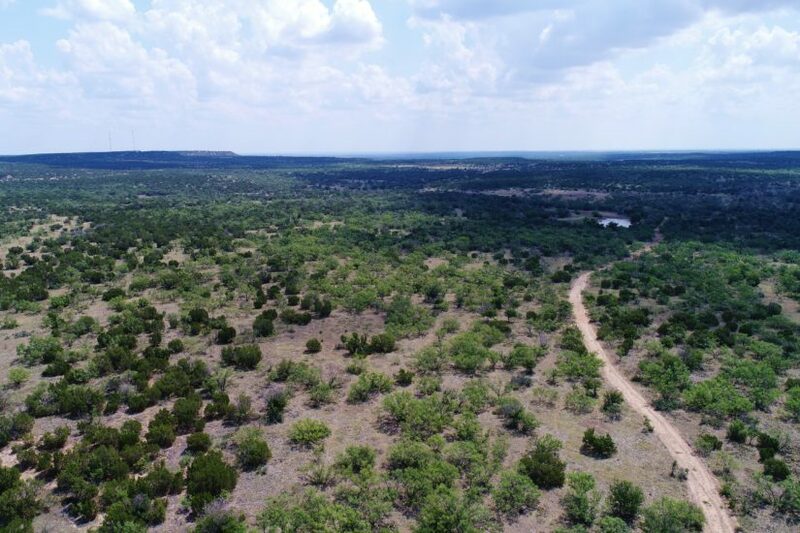 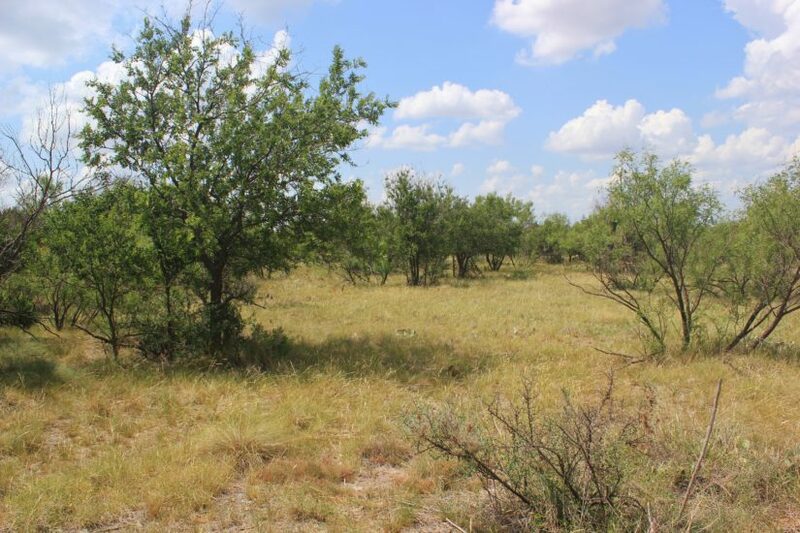 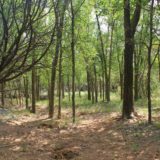 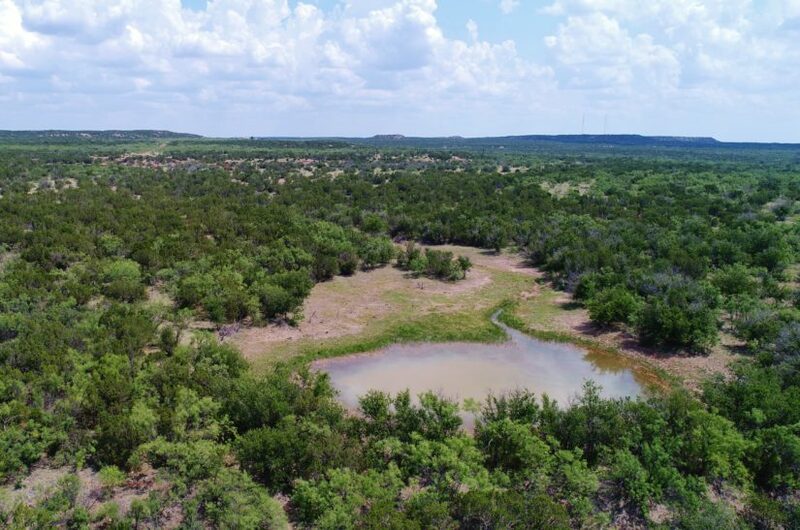 The ranch is surrounded by large acreage on all sides and has lots of brush and trees, perfect for hunting! 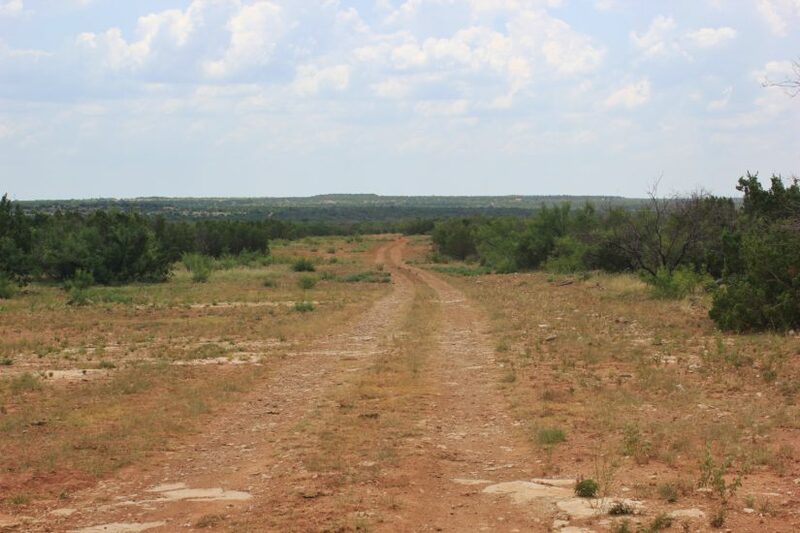 The land is roughly two miles long and one mile wide, with the southern half being wider than the north half. 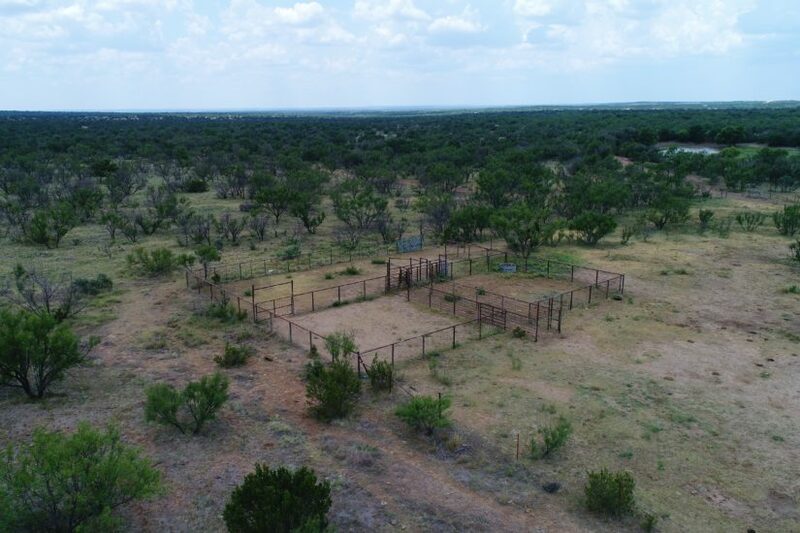 It has a perimeter fence all the way around it and one cross fence, dividing it into two pastures, 255 and 702 acres large. 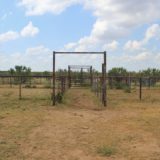 All of the fencing is in good shape with metal -posts and has recently been re-enforced where necessary. 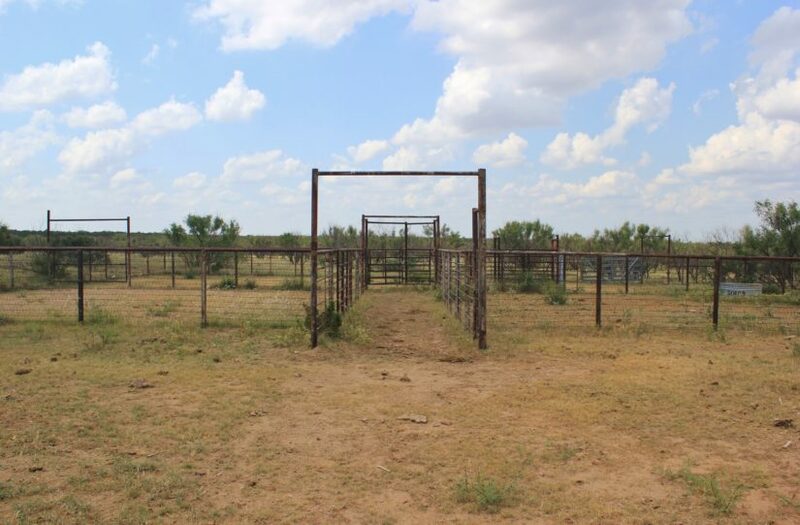 A set of pipe working pens and cattle trap is located in the middle of the ranch too. 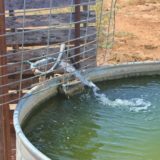 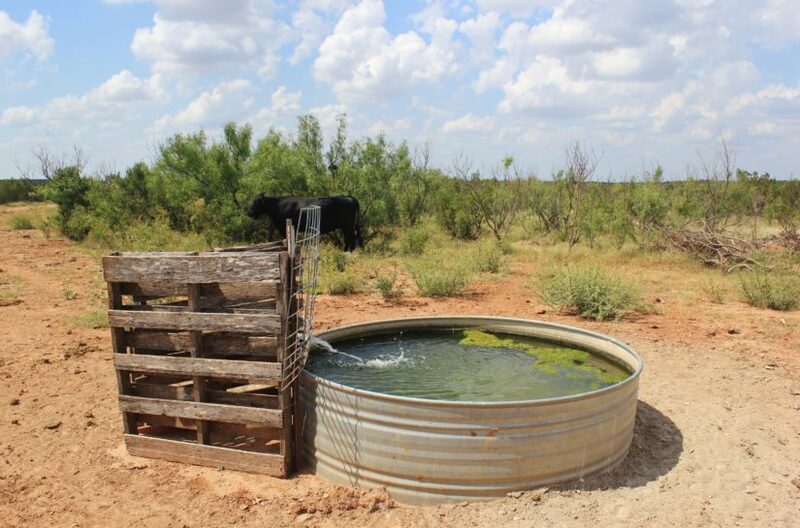 Red River community water has been ran deep into the ranch from the highway all the way down to the pens, with three taps along it for watering cattle and wildlife. 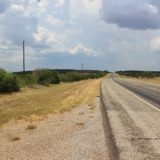 Electricity runs along the highway on the north border, if you wanted to tap on to it. 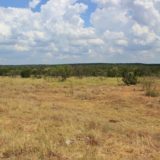 There is a really nice home building site in the north 255 acre pasture near the utilities, which has a great view across the creek valleys to the south. 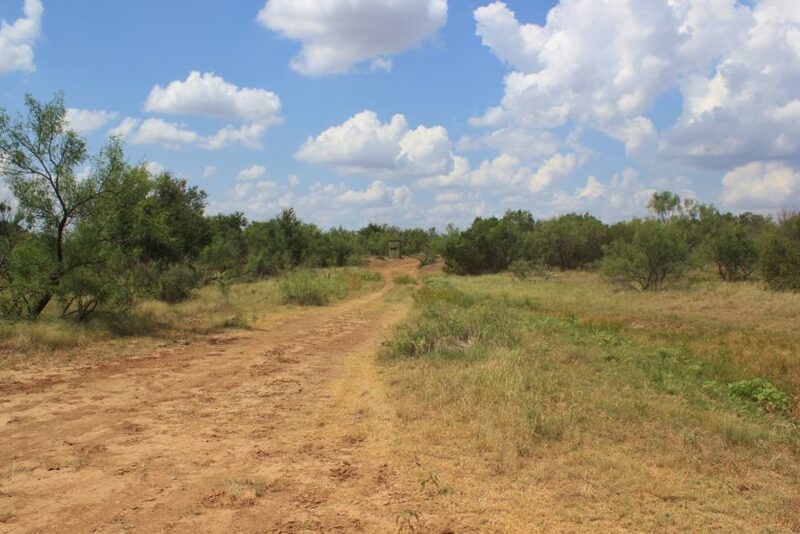 The ranch has 135′ of total elevation change, from top to bottom. 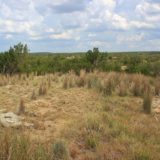 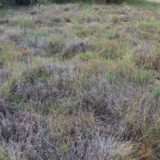 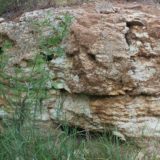 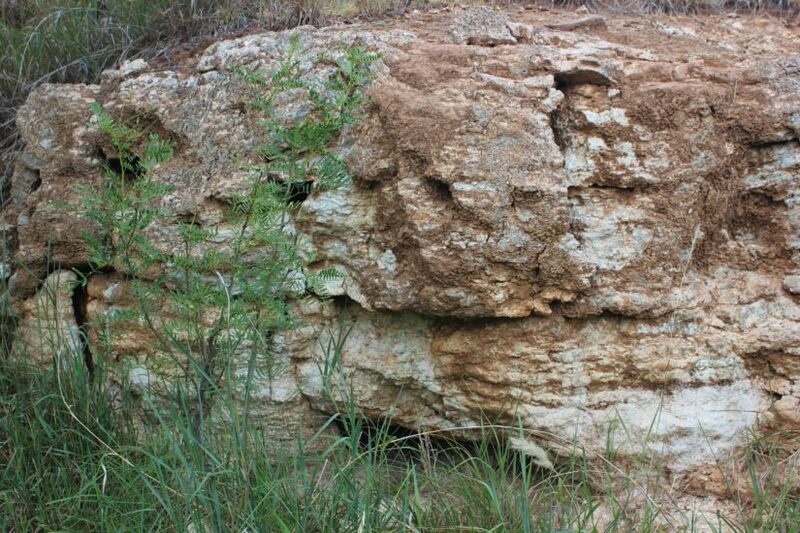 There are some rock outcroppings, but overall the grass turf is above average, with thick native grasses including buffalo, bluestem and gramma. 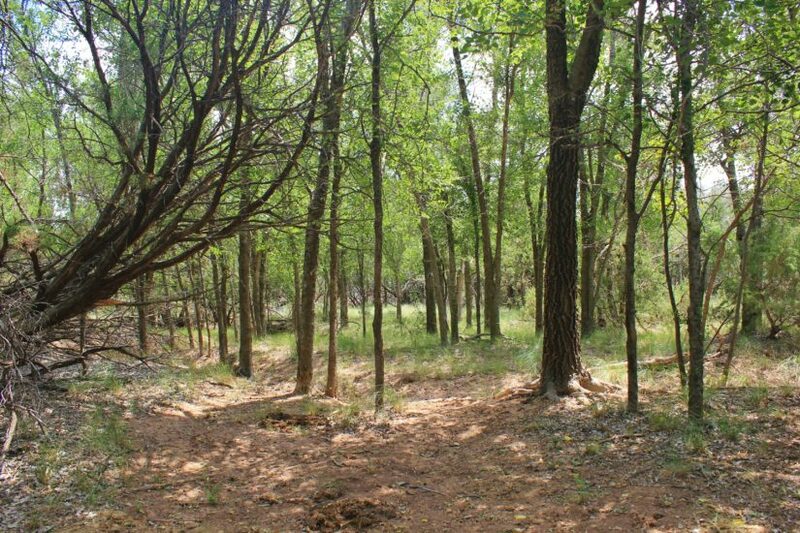 The trees cover is phenomenal, with lots of juniper cedars and mature mesquites. 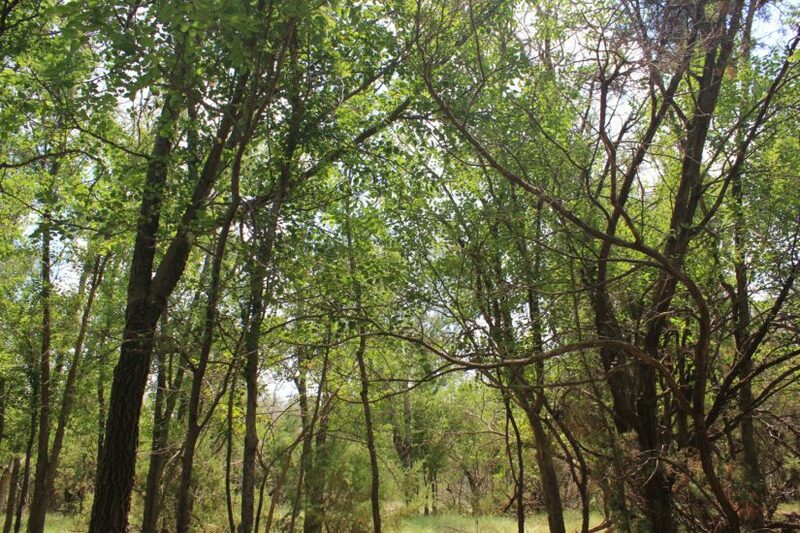 Many hackberries and elm motts will be found throughout the property too, providing a nice assortment of hardwoods. 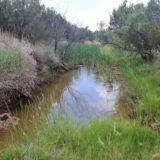 The ranch holds part of the headwaters of Little Good Creek, with several miles of ravines and washes running through it. 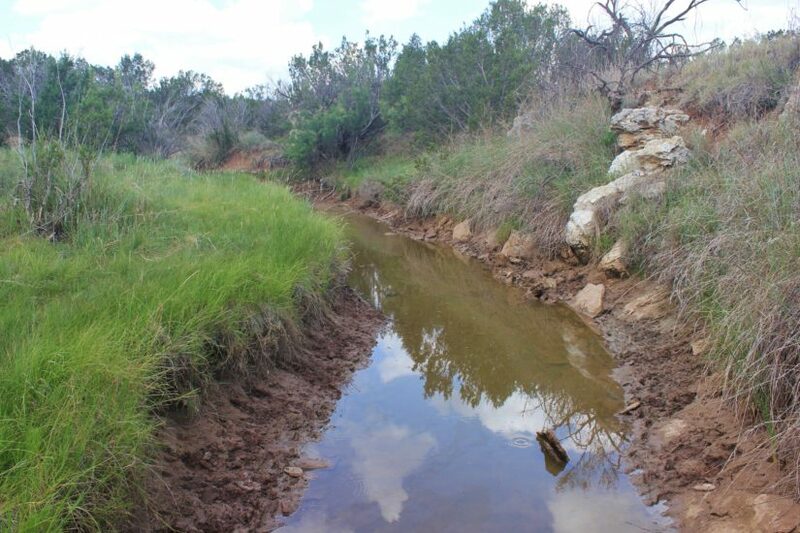 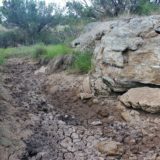 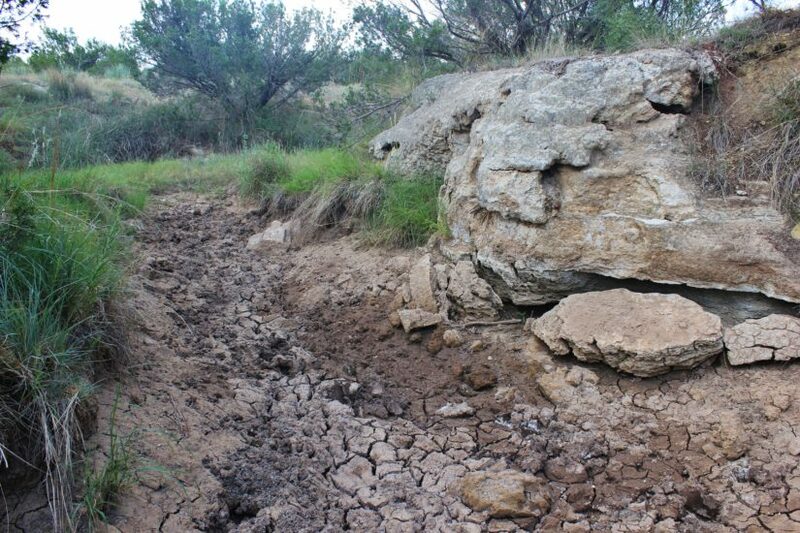 While these are seasonal creek washes, evidence of springs can be seen in several places. 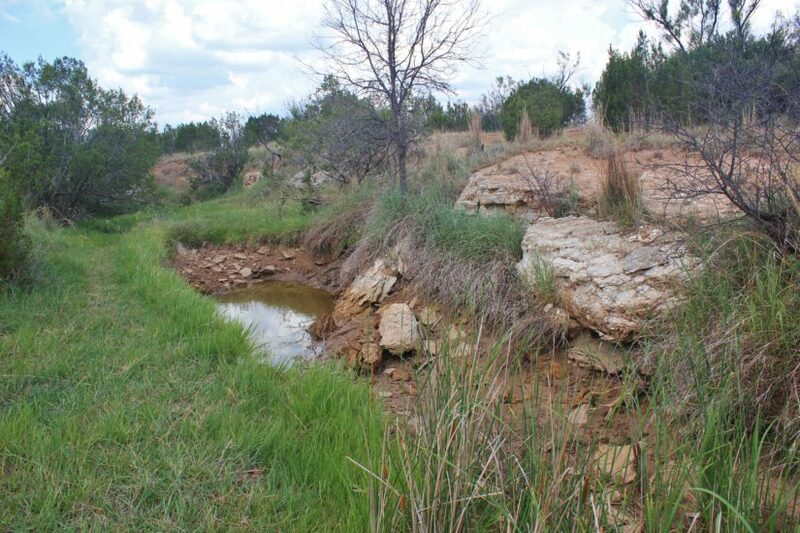 Where the different ravines converge on the southwest corner would be a great place to build large lake dam, which would back up water in the valleys upstream. 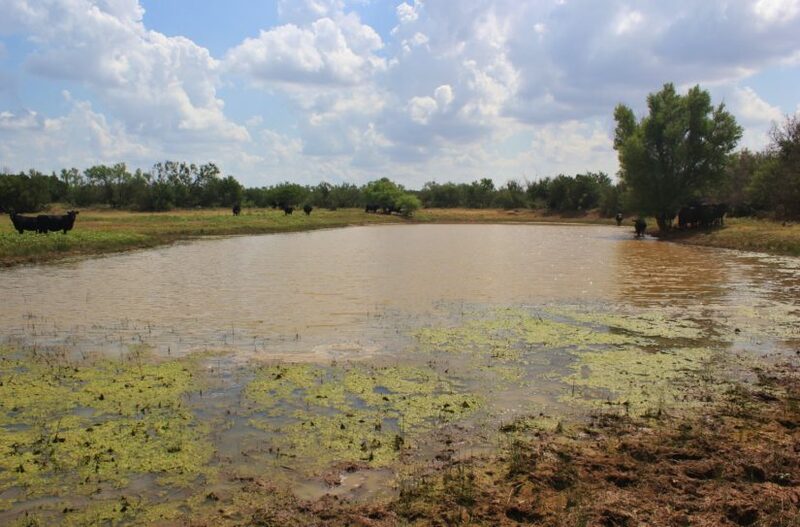 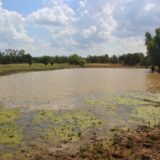 The ranch has six different ponds built along the different creek branches. 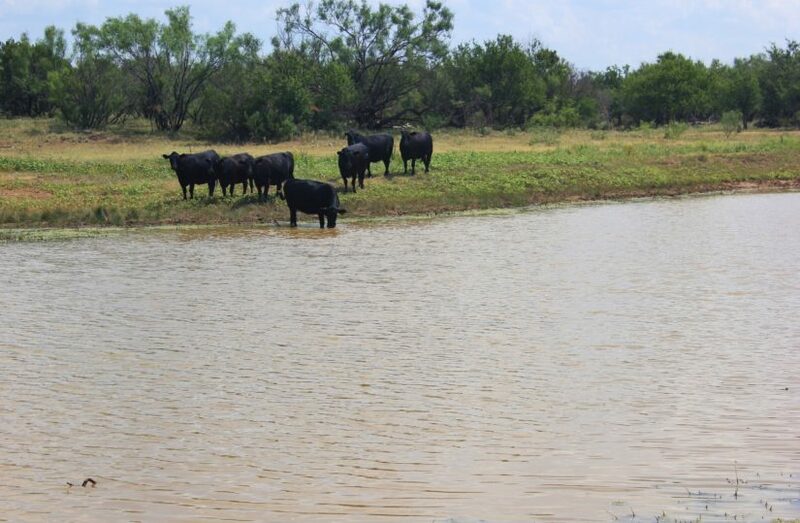 Some of these are small, but some can hold up to a couple of acres of surface water. 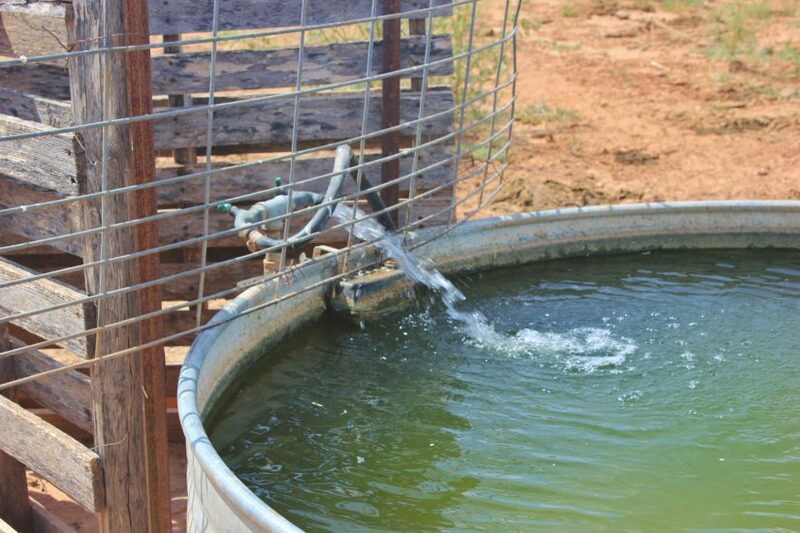 They are shallow and could go dry in a drought though, and would benefit from being dug back out. 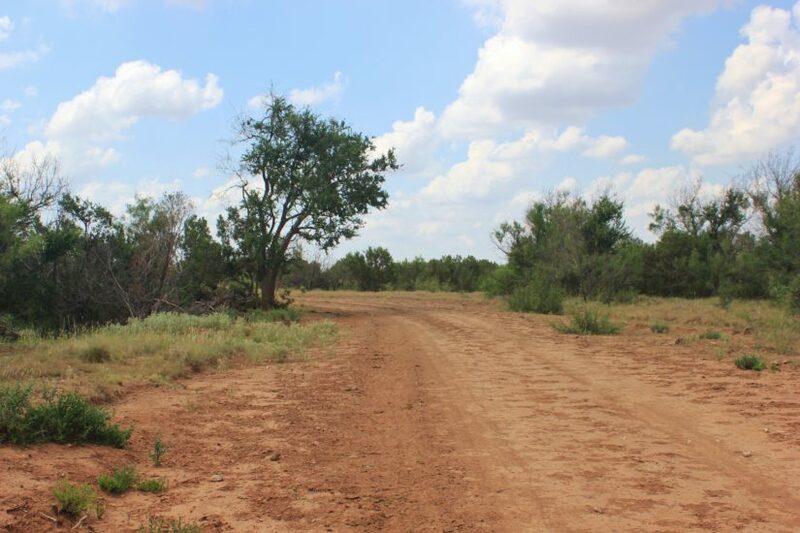 The ranch is in prime whitetail country in Foard County, at the start of the breaks in the western part of the county. 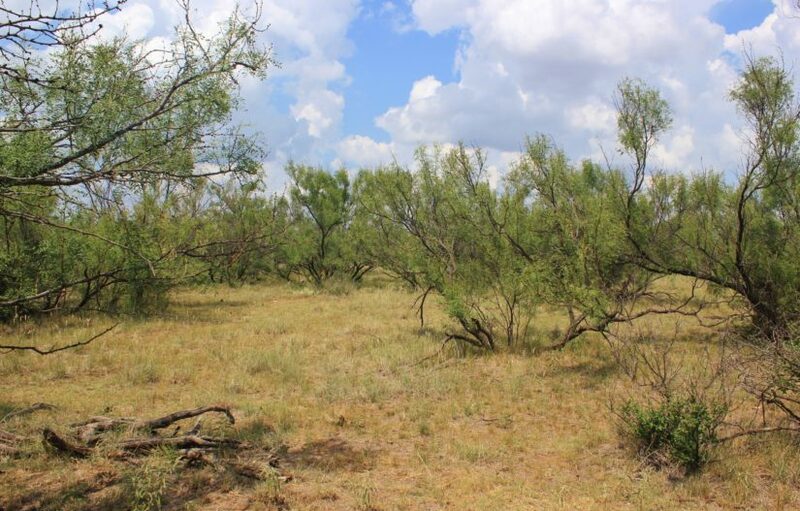 A 170″ B & C buck was taken off the land in 2010. 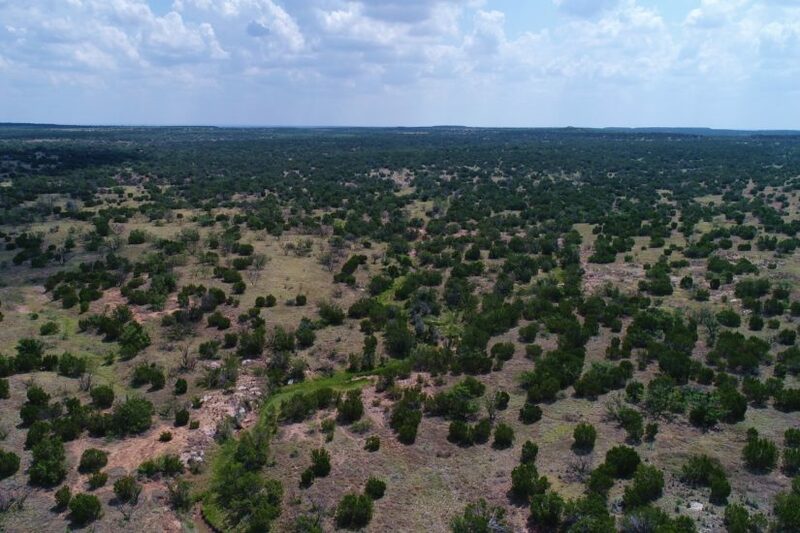 While this is definitely at the top, bucks in the 140s” will be more common. 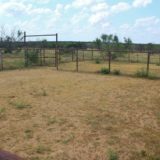 The ranch lays well to high fence too, if you wanted to really control your deer herd or import genetics. 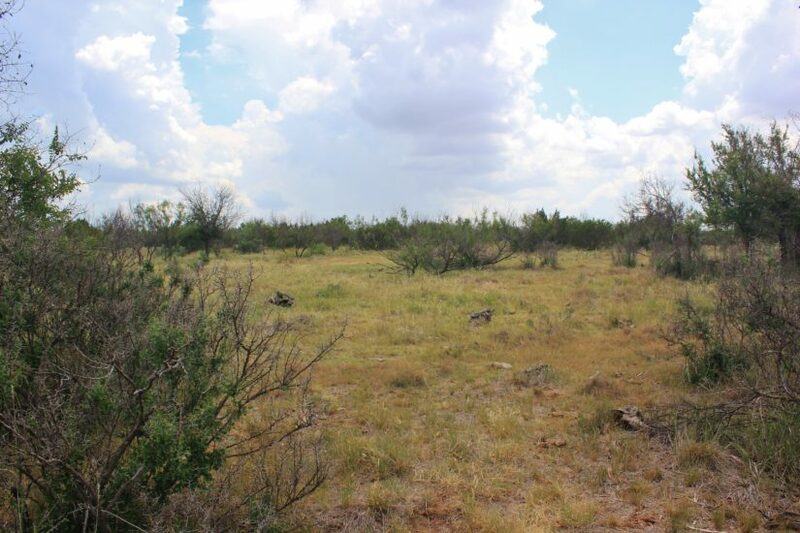 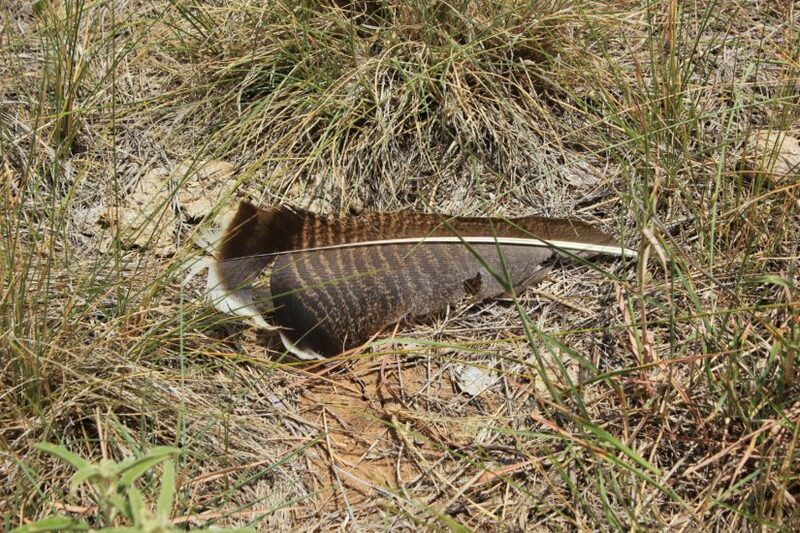 You will also find Rio Grande turkey here, plus bobwhite quail, feral hog, dove, coyote and bobcat. 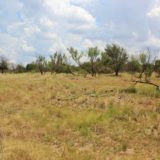 Right now, it is set up to hunt off of feeders, but there are some places in the back pasture that could be cleared for food plots. 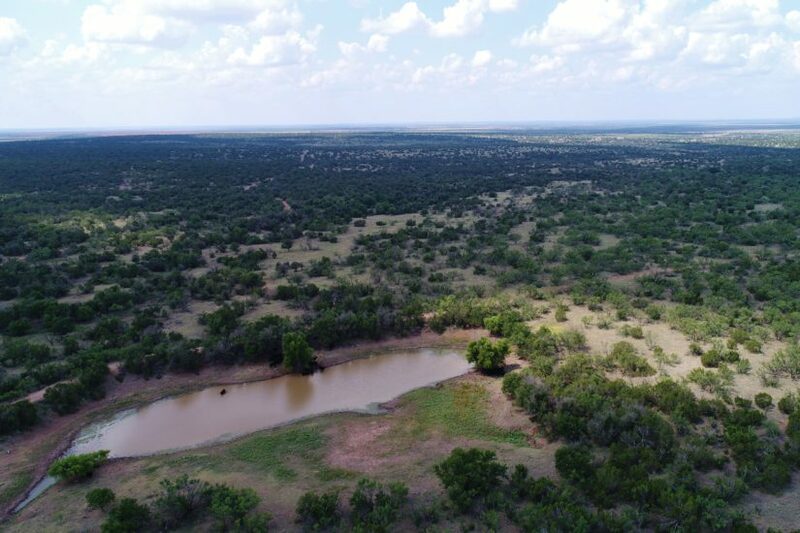 Other large acreage ranches are just down the road too, including the 25,000 acre Y Ranch and 90,000 acre Triangle Ranch. 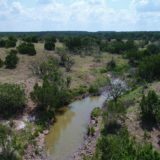 This is big ranch country in Northwest Texas. 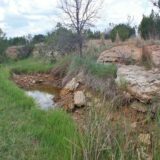 The property lies at one of the highest points in Foard County and the views go on for miles here. 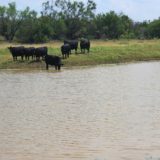 The current owner has been running 45 cow-calf pairs year around, with winter hay. 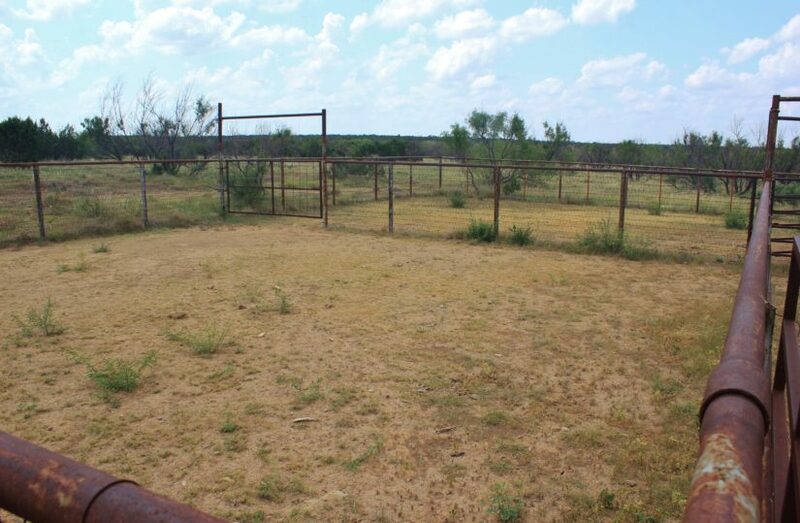 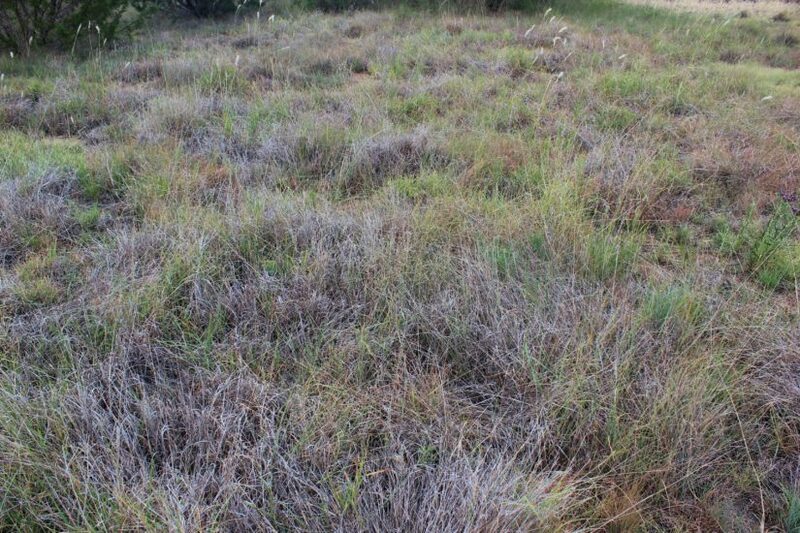 As stated above, this land has exceptional good grass turf and plenty of water. 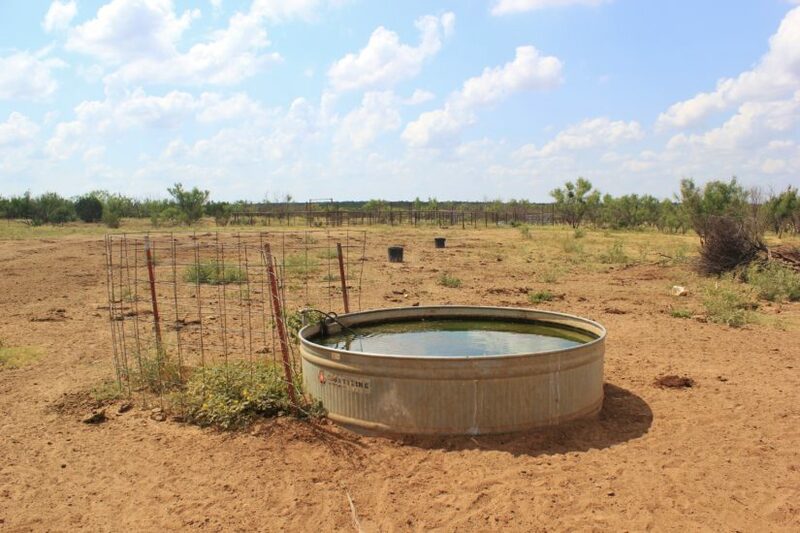 The owner doesn’t own any mineral rights, so there are none to convey. 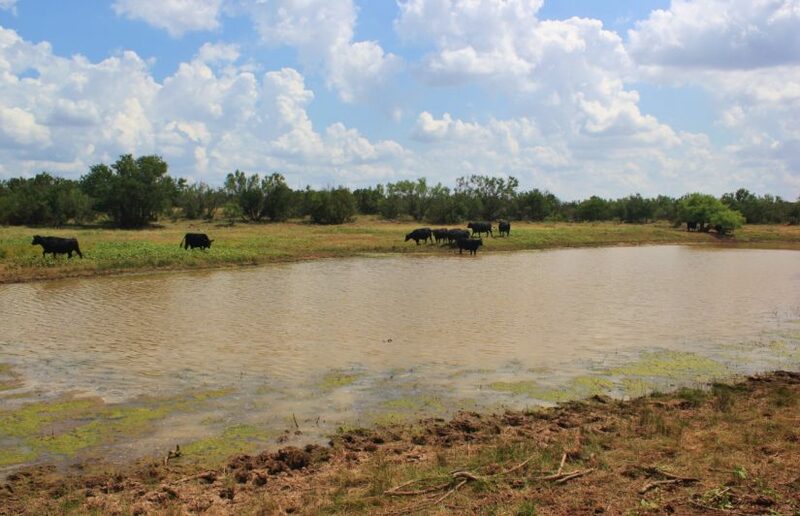 There are not any oil wells on this ranch or much south of Highway 70. 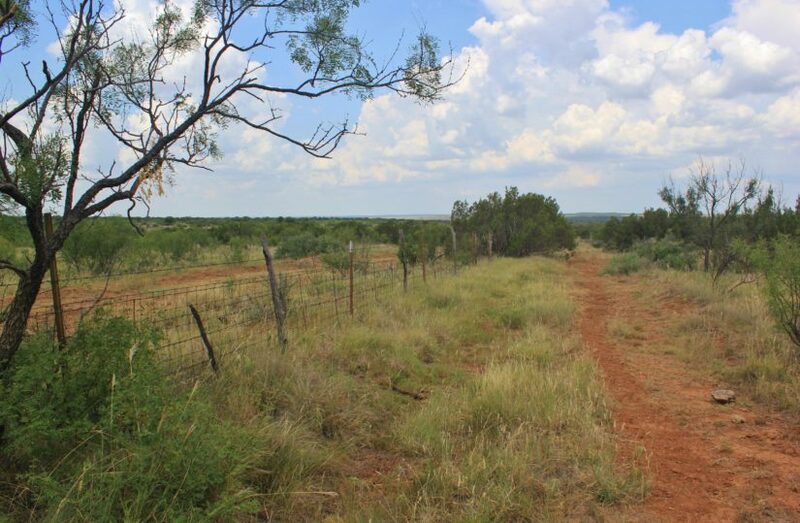 One of the ranches north of the highway has some production on it. 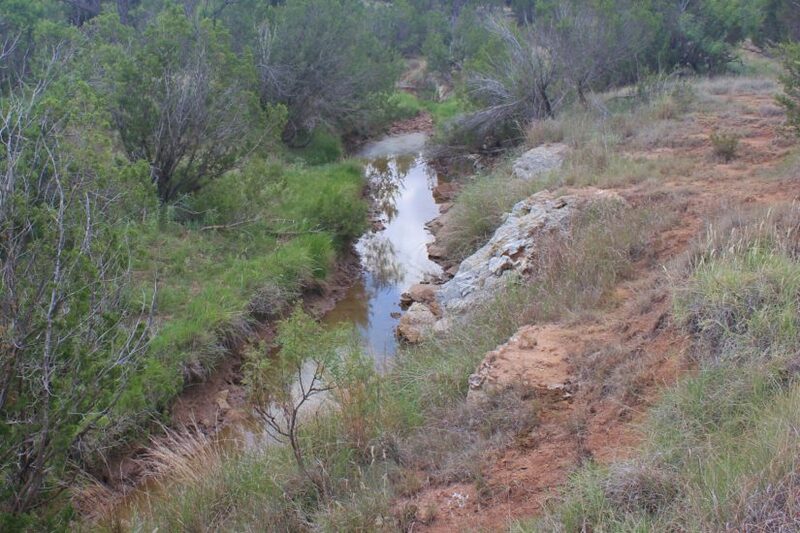 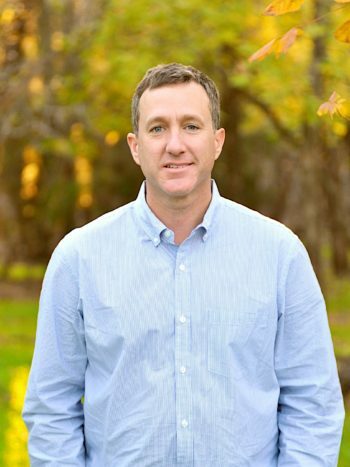 The Little Good Creek Ranch is being offered for $1,095/acre, or $1,052,842 total. 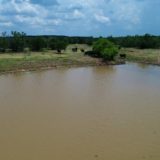 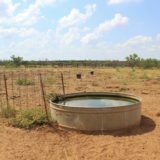 The owner will keep all cattle and any non-attached items, like feeders, etc., and will need a 90 day notice to move all cattle from the property. 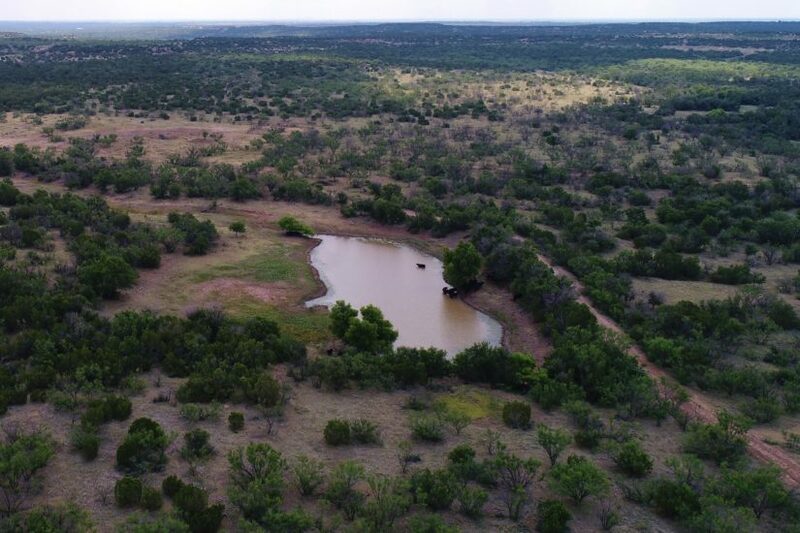 For more information or to see this ranch in person, contact agent Benjamin Belew at cell phone (940) 357-9940.